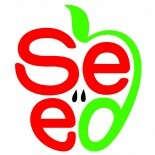 This year’s SEED scholarship went to Max Davern, for his essay on how SEED could use its funds for more high school student field trips and career interest internships for all high school students. Pictured here is Max with SEED Chairman, Bob Draffin. Best of luck to you at SUNY Albany, Max! This entry was posted on July 11, 2018 by SEED Info in Uncategorized.